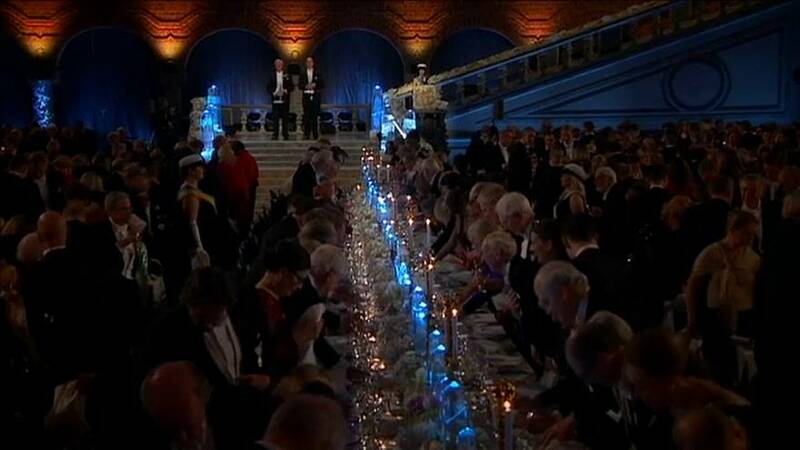 Sweden's royal family lead by King Carl XVI Gustaf put on a glittering display on Sunday in Stockholm as the world's great and the good were awarded their prestigious Nobel prizes. Those for medicine, physics, chemistry, literature and economics are handed out in Sweden, while the one for peace always takes place in Norway. At an evening banquet the winners reflected on what it meant for them to be honoured by what is widely considered the most highly regarded of international awards. "We live today in a time of growing tribal enmities. Of communities fracturing into bitterly opposed groups. Like literature, my own field, the Nobel Prize is an idea that in times like these helps us to think beyond our dividing walls, that reminds us of what we must struggle for together as human beings." While the mood was of celebration critics of the Nobel committee have pointed out that not one of the 11 laureates chosen this year is a woman. Meanwhile in Oslo a candlelit procession took place in honour of the Nobel Peace Prize winner, the International Campaign to Abolish Nuclear Weapons. Beatrice Fihn accepted the prize on behalf of the group which is a driving force behind an international treaty to ban nuclear weapons.However Fihn is not herself a laureate. One half the the Physics prize was awarded to American physicist Rainer Weiss, and the other half jointly to American experimental physicist Barry Barish and American theoretical physicist Kip S. Thorne, 'for decisive contributions to the LIGO detector and the observation of gravitational waves'. The Nobel Prize in Chemistry 2017 was awarded to Swiss biophysicist Jacques Dubochet, German-born American biophysicist Joachim Frank and Scottish molecular biologist and biophysicist Richard Henderson, 'for developing cryo-electron microscopy for the high-resolution structure determination of biomolecules in solution. The Nobel Prize in Physiology or Medicine 2017 was awarded jointly to American geneticist and chronobiologist Jeffrey C. Hall, American geneticist and chronobiologist Michael Rosbash and American biologist and geneticist Michael W. Young, 'for their discoveries of molecular mechanisms controlling the circadian rhythm'. The Nobel Prize in Literature 2017 was awarded to novelist, screenwriter, and short story writer Kazuo Ishiguro, 'who, in novels of great emotional force, has uncovered the abyss beneath our illusory sense of connection with the world'. The Nobel Peace Prize 2017 was awarded to International Campaign to Abolish Nuclear Weapons (ICAN) 'for its work to draw attention to the catastrophic humanitarian consequences of any use of nuclear weapons and for its ground-breaking efforts to achieve a treaty-based prohibition of such weapons'. The Sveriges Riksbank Prize in Economic Sciences in Memory of Alfred Nobel 2017 was awarded to Richard H. Thaler, 'for his contributions to behavioural economics'.